Women come and go through Woodcock’s life, providing the confirmed bachelor with inspiration and companionship, until he comes across a young, strong-willed woman, Alma (Vicky Krieps), who soon becomes a fixture in his life as his muse and lover. Once controlled and planned, he soon finds his carefully tailored life disrupted by love. Phantom Thread is an exquisite film from masterful director, Paul Thomas Anderson. Once again (in this, his eighth movie), Anderson displays an endless talent for spinning visually stunning, gripping and multi-layered stories - tales that always reward repeat viewings. While it is hard to categorise Phantom Thread, the film is perhaps best described as a gothic romance (Hitchcock’s Rebecca is a key influence). However, the film could also be labelled as a ghost tale, a twisted love story, a thriller and a comedy (it is undoubtedly PTA’s funniest film since 2002’s superb Punch Drunk Love). 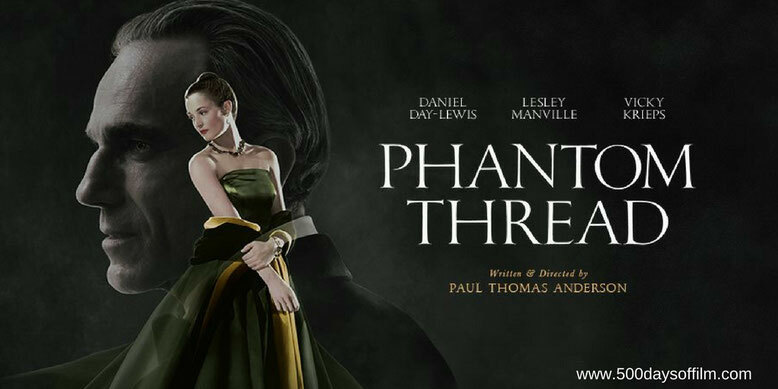 Phantom Thread is also notable for being the final (if we are to believe him) role for Daniel Day-Lewis. If this proves true, what a way to end a remarkable career. He is absolutely wonderful as Reynolds Woodcock (a character that he developed in close collaboration with Anderson). This is an utterly delicious performance. However, Phantom Thread is most interested (as are we) in the women in Reynolds's life - particularly his complicated muse Alma (Vicky Krieps) and his controlling sister Cyril (Lesley Manville). Their relationships - with Reynolds and each other - are utterly fascinating. Meanwhile, another woman - Reynolds’s mother - becomes an increasingly haunting presence. Manville and Krieps more than hold their own on screen with Day-Lewis. Both actors are superb. Their powerful (and yet also restrained) performances allow Paul Thomas Anderson to develop his themes of power and control. They also enable the director to explore what it means to live with such a brilliant and yet difficult and uncompromising individual. Paul Thomas Anderson is renowned for creating immersive worlds and Phantom Thread feels wonderfully authentic. Shot on location, this claustrophobic world seems remarkably real. There is breathtaking attention to detail here (all the main dresses were made bespoke by costume designer, Mark Bridges) - making this a film that demands several viewings. Meanwhile, guiding us through this (often twisted) story is Phantom Thread’s brilliant score by Jonny Greenwood. The composer has, of course, worked with Paul Thomas Anderson before (check out his stunning work on There Will Be Blood, The Master and Inherent Vice) but this score is nothing short of perfection - worthy of its many accolades. It is easy to forget that until a few weeks before its cinematic release, we knew very little about Phantom Thread. Now Paul Thomas Anderson’s film feels like an absolute classic. The term phantom thread refers to how seamstresses working in Victorian London felt after a long day in the workshop - their fingers would continue to move automatically, sewing a ‘phantom’ thread. Have you seen Phantom Thread? If you have, what did you think of this film? Let me know in the comments section below or let’s chat over on Facebook or Twitter (@500DaysOfFilm).